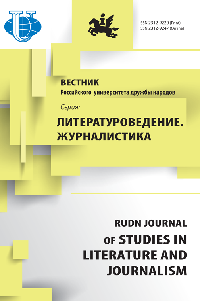 "RUDN Journal of Studies in Literature and Journalism" has been published since 1996, Periodicity – once a quarter. The journal is a periodic peer-reviewed scientific publication in the field of literary studies and journalism. The journal is international composition of the editorial Board, and authors and topics of publications. The editorial board consists of scientists from Russia, the United States, France, Italy, Turkey and China. "RUDN Journal of Studies in Literature and Journalism" is included in "List of leading reviewed scientific magazines and editions in which should be published basic scientific results of dissertations on competition of scientific degrees of doctor and candidate of Sciences", defined by the Higher attestation Commission of the Ministry of education and science. El Ghamry M.A., Gab Allah M.A. Sharikov A.V., Proskurnova E.L., Kandakzhi L.
Algavi L.O., Volkova I.I., Kadirova S.N., Rastorgueva N.E.